Vintage 1954 photo of Jose Froilan Gonzales, 1954 Grand Prix of Britain. 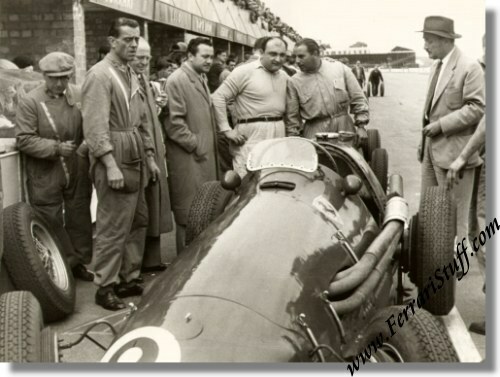 This photo was taken in the pits at Silverstone during the 1954 British Grand Prix and shows Jose Froilan Gonzales with his Ferrari 625 along with chief mechanic Meazza and on the right a gentleman called "Amerotti" according to the notes on the back. Mr. Amerotti is unknown to me. Fangio, driving for Mercedes, had set the pole position but was overtaken by Gonzales the very first lap and Gonzales did not give the lead away anymore and finished more than a minute ahead of second placed Mike Hawthorn, also on Ferrari 625. Fangio finished 4th in his Mercedes W196. The photo measures some 20 x 15 cm or some 8 x 6 inches and is a VINTAGE print i.e. printed shortly after the image was captured.